Learning to cut your kid’s hair can save you a lot of money. It also requires a saintly amount of patience. 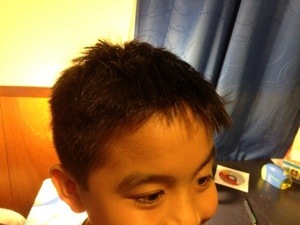 I decided to try cutting my 8-year-old’s hair and save the 17 bucks that the local Supercuts wanted for a haircut. 17 dollars!!! Whatever happened to “Shave and a haircut, two bits”? Anyways, after trying with my Norelco beard trimmer and giving him a bald spot, I decided I needed better tools. I treated this like a weekend home improvement project and ran out to pick up a set of clippers, some scissors and a barber pole. We restarted the salon session after a visit to the local drug store where I found a complete haircut kit for $15. What a deal… clippers, a comb, scissors and smock. Thank you cheaply made Chinese goods. We finally got it right and were even able to hide the bald spot. There is no real moral or lesson to this story other than in my old age I’m getting too cheap to pay $17 for a stinkin’ haircut.